In 12-inch nonstick skillet, cook all ingredients over medium-high heat 8 to 10 minutes, stirring frequently, until beef is thoroughly cooked; drain. To use within 3 days, spoon into 2 (3-cup) containers; cover and refrigerate. 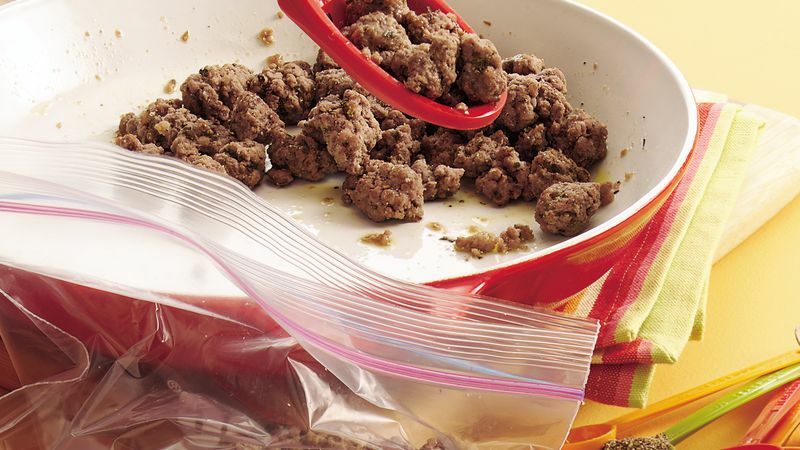 Or to freeze until ready to use, spoon into 2 (3-cup) freezer containers; cover and freeze for up to 3 months. What's quicker than cooking ground beef? Cooking a big batch of meat and freezing it for those nights when you're really short on time. This seasoned meat (makes 4 to 5 cups) can be added to spaghetti sauce. The mixture can be frozen for up to three months.